Reprint. Originally published: London: Harvill Secker, 2018. 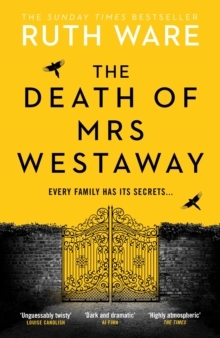 THE SUNDAY TIMES BESTSELLER`Powerfully atmospheric, unguessably twisty...I devoured it' LOUISE CANDLISH, bestselling author of OUR HOUSEThe Death of Mrs Westaway is Ruth Ware's best: a dark and dramatic thriller, part murder mystery, part family drama, altogether riveting' A. Dark, unsettling and brilliant.' HEAT'[An] explosive claustrophobic family drama laced with a touch of du Maurier.' WOMAN & HOME When Harriet Westaway receives an unexpected letter telling her she's inherited a substantial bequest from her Cornish grandmother, it seems like the answer to her prayers. There's just one problem - Hal's real grandparents died more than twenty years ago. Hal desperately needs the cash and makes a choice that will change her life for ever. She knows that her skills as a seaside fortune teller could help her con her way to getting the money. But once Hal embarks on her deception, there is no going back. She must keep going or risk losing everything, even her life... The brand new psychological thriller from the Sunday Times and New York Times bestselling author of The Woman in Cabin 10.